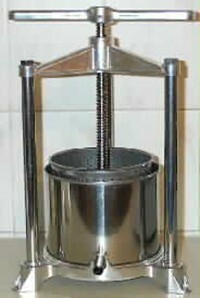 Small fruit press made of stainless steel and aluminium, just the job for soft fruits on a smaller scale. If you dont have huge amounts and storage is an issue this could be for you. Stainless steel and aluminium construction makes it easy to clean. Probably better suited for soft fruits, fruit juices, herbs and possibly cheese.